I’ve read this and it left me dumbfounded, so I read it again… I’m still dumbfounded. 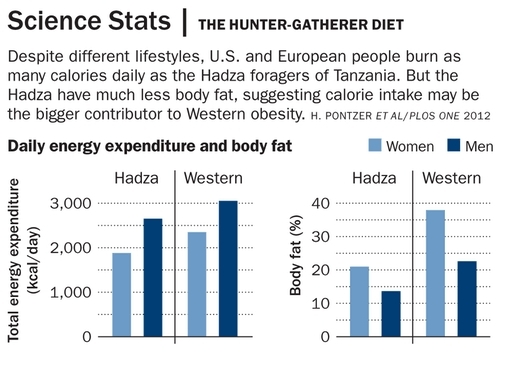 Does it really say, “… calorie intake may be the bigger contributor to Western obesity”? What are they thinking? What else causes obesity? I have noticed over the years, a growing effort to find ‘genetic’ causes for why some people get fat easier that others. Certainly, in the end, every facet of our lives has a genetic basis. What I detect however, is a desire to single out genetics in particular as a major reason for obesity (1). Why Not ‘Just Say No’? This smells like a detour around free will. It conveniently leaves the free will—‘just say no’—dogma intact by putting particular emphasis on genetics. Cute! This is one way to have our cake and eat it too. My response has often been, “Just go to Ethiopia, and see how many fat people you see”. In all my travels, I only saw obese people aplenty in wealthy, well-fed countries. Simply put, the amount you eat will make you fat if that consumption exceeds the calories you burn. Is this not simply biochemistry? When the energy in exceeds energy out, it gets stored as fat. Some burn more energy (higher metabolic rate) than others, and so they can eat more without putting on the pounds. The others are simply taking in more than their body needs and end up storing the excess as fat (for a rainy day that never comes). Getting older has a sure-fire effect on one’s metabolic rate. That is nature’s safeguard in the wild; an older animal can’t hunt or gather as vigorously as a younger one, so nature lowers their metabolism, which lowers their daily caloric requirement. That is great if you’re living in the wild, but usually just the opposite for anyone living in the affluent circumstances of civilization. We are not different from other animals in regards to eating tasty food. When dairy cows are given unbridled access to rich tasty feed (alfalfa, sorghum) they will eat, and eat, and eat until it kills them. They did not evolve to eat such rich food. Constant eating in the wild is self-limiting in natural ways so they never over eat. Penned up with access to ‘unnatural’ food, dairy cows eat to their death. Sound familiar? Food is a business. Sellers are motivated to make their offering as rich and tasty as possible. Buyers, having evolved no natural restraints to rich and tasty foods, easily over eat if they have money and access. Indeed, in the wild, our innate drive to eat as much rich and tasty food as we can find, is a survival necessity. We still have that instinct; only the circumstances have changed. Now we too can actually eat until it kills us. I find it quite ironic how we maintain the myth of free will in spite of all the evidence to the contrary. I now see the ideal of free will as wishful thinking—a cognitive counterpart to the emotions of ‘should’ we feel. Our ability to imagine ourselves, and especially others, able to ‘decide’ and just say “No” overwhelms empirical observation. We’re in denial as a species. And yes, I’d say that is also genetic. (1) I guess I am balking at the ‘victim’ aspect of this genetic rationalization, especially as we are so unwilling to concede that we are instinct driven animals, with genetics and circumstances accounting for everything we do—good or ‘evil’. So far, such rigorous self-honesty eludes us; double standards rule our day. As the Tao Te Ching says, When cleverness emerges there is great hypocrisy (D.C. Lau) and When intelligence increase, there is great falseness(Word for Word). Our clever intelligence enables us to deftly detour and deny reality! So true, Carl. When I was active in the dojo, I found that my best (read: smoothest, most natural, most effective) karate came when I stopped trying and moved without thinking. It is hard for me, still, whether karate or considering a topic like this. The clarity always comes when I forget about it for a while .. Yes Mike! Isn’t it wonderful how just “sitting with it for a bit” clarifies. To paraphrase chapter 63’s “Do without doing“, we just need to slow down an “look without looking”. I completely agree with your premise that we are instinct driven creatures. I think I “knew” this intuitively (instinctively 🙂 ) long before I understood it cognitively. After letting your comments from my last question sit for a bit, it now makes sense to me that our rationalizations around our instinctive behaviors are the “cleverness” and the “falseness” that get us all screwed up in the mind.